Hockey Dad – a name that could have been hinting at a boyhood of being driven to the hockey practise by an invested dad. Then again, Billy Fleming and Zach Stephenson did grow up in Windang – Australia – so with that information at hand it makes more sense that the band name actually came from a Simpsons episode. Well, it sort of does. Blend Inn is Hockey Dad’s second studio album, but the Windang natives have dropped an EP and a few singles ahead of that as well. The surfer punk-duo went to Seattle to record their latest album, along with producer John Goodmanson, and both the name and the actual music reveals the fact that they are far away from home. Twelve songs and 40 minutes of (mostly) fast beat punk tunes and a sense of a melancholic longing to somewhere else. The record kicks off with The Stride which feels like a spot on preview of what’s to come. Homely Feeling is up next. It was released as a single in 2017 and landed a 54 on the Australia Hottest 100 list, that was announced in January. Listening to it feels like landing in a sweaty nightmare where you find yourself in the wrong place, at the wrong time. The sound brings Smashing Pumpkins into mind, but feels more straight forward. A bit simpler, if you will. Moving on to I Wanna Be Everybody, the duo manages to find a nice mix of melodic, almost nostalgic, tunes and rougher, cockier features. This one could have been a good option to release as the lead single of the album. Danny is an easy listen and potentially brings the listener a bit closer to the composers. Although a bit repetitive, it’s easy to get cradled into the melancholic rhythm. Join the Club has a sort of indie pop-sound to it, despite the fast drums and the vibrant electric guitar. Whatever is jammed packed with slow, extended, and pleasant notes. The small occasional feature of whistling adds to it. It’s chilled and heavy at the same time and has a Twin Peaks inspired sound to it. Disappoint me will slap you right back into the beat. The vibe and lyrics say “worn out” but the energy says “more to come”. Running Out is that tune that is being played live on an intimate venue while you’re deep into a mosh pit and the sweat is flying – and would probably be best enjoyed live. Just like the one before it, Stalker has that crowd feel to it. Punk, when punk is repetitive, youthful and a bit creepy. Nothing wrong with that. Where I Came From is that old fling that tries to reel you back into a poisonous relationship. Like most of the stuff on Blend Inn, it could fit perfectly into the soundtrack of season 3 of The O.C. in 2005. (And that is a good thing). The high pitched harmonies that come in towards the end is a nice finish to it. Sweet Release is nothing but a fired up barbecue in the backyard with a bunch of friends “having a time, and losing their minds”. It really is a sweet release. Extra feels due to the Fleming’s Australian accent that gets to shine throughout the song. Eggshells has the honor of summing things up, and it does it well – in a mellow and dreamy kind of way. Now go back to the top, and listen to it all again. This album benefits from being repeated. 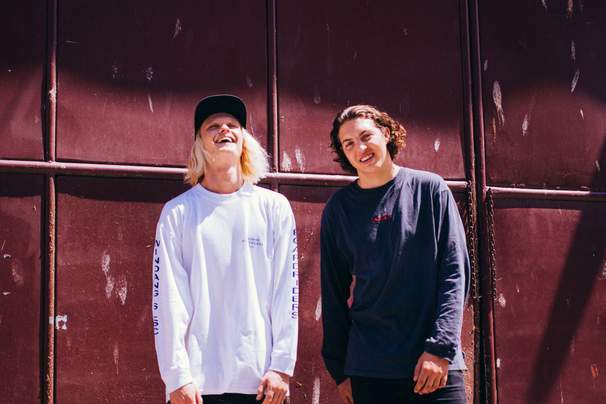 Blend Inn will bring you on a ride straight into a garage somewhere in the Australian suburbs where two mates are playing around with a guitar, some drums and possibly a bass – in between the surf and skate sessions. Although the record appears to be pretty straight forward at times, it can’t be denied that the 12 songs are a pretty sweet ride. If their first album Dreamin was leaning more towards the indie-rock surf sound, Blend Inn is more of an Australian laid back version of 90’s post punk. Instead of singing about the dirty bars of London or New York, the sea is in focus – and instead of heroin and rum there is a few cans and molly with the cul-de-sac crew. The Windang duo definitely has something, but probably needs to go through a couple more albums to develop their sound and songwriting. Just like with other garage rock bands like Wolfmother, Stephenson’s high pitched pipe works in their favor. Blend Inn is a dirty, easy listening indie punk record that goes down well. Ramones and Arctic Monkeys meat Dune Rats and Blur – then you just add a couple of surfboards, and you have Hockey Dad. Blend Inn, the new album from Hockey Dad is out now via LAB Records.